On Wednesday, 22 January 2014, Tom Brake MP, Carshalton and Wallington, is hosting a Cycle Summit to look at cycle safety, as part of his Better Transport Campaigns. The event is taking place at the Trinity Centre, Holy Trinity Church, Maldon Road (at the junction with Manor Road), Wallington, SM6 8BL, and starts at 6.30pm. Details on Tom’s Facebook page. Please join us if you can. 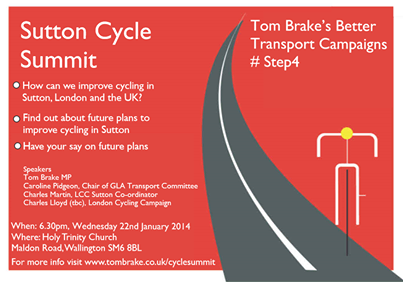 Update: To find out what subsequently took place at this event, see Sutton Cycle Summit 2014.